The Cinema Society joined forces with RentTheRunway.com and Grey Goose Vodka to present an exclusive screening of Robot & Frank, a futuristic film featuring Frank Langella, Susan Sarandon, Liv Tyler, Peter Saarsgard, Jeremy Sisto, Jeremy Strong and James Marsden. 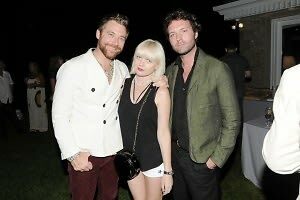 Hosted at the decadent home of Jerry and Judy Della Femina, the screening was much more than a glamorous gathering to watch a movie. Cocktails by Grey Goose were enjoyed, especially their Hamptons Punch and food from Gabby Karan and Gianpaolo de Felice's restaurant Tutto il Giorno provided a fine Italian feast for the stars. Other attendees included John Slattery, Barbara Walters, Joy Behar, Judith Giuliani, Russell Simmons, Matthew Settle, Zosia Mamet, Kelly Klein, Hilary Rhoda, Alina Cho, Katie Lee, Lola Schnabel, Gretta Monahan and Andrew Saffir. The party started early, but definitely ended late. Cocktails and supper were followed by an outdoor screening around the pool. Waiters set up blankets on the grass, while the actors of the film got VIP seating on couches closer to the screen. And the fun didn't stop there. 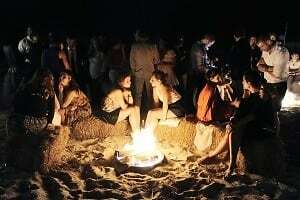 The party continued to the beach, where a beach bonfire was kept burning strong for at least a few hours.